If you do have the need to travel over the road with your motorcycle on a trailer, there are some basic procedures you should follow when loading it so that the bike, you and everyone around you remain safe and have very enjoyable trip. Below are some suggestions for making the whole process easy and stress free. After all, it’s hard not to be worried when you are putting your bike in place on such an unfamiliar parking space. However, take your time and be very deliberate in what you check while also taking heed of the following tips and it should all go smoothly. The very first step here – once you have your trailer – is to read the instruction manual which came with it thoroughly. If there is a video, watch it. Learn as much about how the trailer works as you can. Some of the following steps will not apply to you and some will, so pay close attention to the manual you are given. Get your ratcheting tie-down straps together (the trailer should have a way to secure all four corners in some cases, but this does depend on the trailer model), your soft-ties (if you have them), handlebar harness (if you have one), and a wheel chock of some type – whatever you have to lock the wheel(s) in place; a permanent front wheel unit is one of the best purchases you can make, but a wedge of wood may will work in many circumstances. Follow the proper instructions for getting the trailer ready to load the bike. Place your ratcheting tie-down straps in place in front and back, depending on trailer design, in a way where they are out of the path of the motorcycle wheels and can be grabbed easily; from the bike if you are alone in this task. Also, put your handlebar harness across the front of the bike so that you can get to it when you need it and it will not fall off or cause any damage. Check again to be sure that the trailer is locked in its position and attach a ramp, tilt the trailer, again depending on the type, or put in place whichever method you use to get the bike up on to the trailer. Some say to simply ride the bike onto the trailer, but only do this if you are experienced and comfortable with how to do this safely – there are loads of videos on YouTube where this went horribly wrong, so be careful. If you do not ride it on, push it up onto the trailer; if you have to lift it up, do so carefully one wheel at a time – not using a ramp makes it very wise to have a friend help you out here. If you have a permanent front wheel chock in place, maneuver the front wheel into place. Wile holding the motorcycle in place: Secure your handlebar harness across your handlebars, if you have one. Whether or not you do, secure the front straps to the front bars of the bike and cinch them down evenly and progressively on each side. One suggestion is to go back and forth, left to right, a little each time. If you have the permanent front wheel chock, you can usually safely let go of the motorcycle at this point. If not, keep holding on and attach the rear straps to a safe location on the rear frame/subframe and cinch them down as you did the front pair. Do not over-tighten any of these straps – you may damage your suspension. For long-travel suspensions, get a block to keep the forks from compressing completely and save the seals. There may be more fasteners at this point, make sure to follow the instructions which accompanied your trailer model. Now, either lock the bike in place with the permanent front wheel chock, place a professional-grade rear wheel chock at back, or place your own wheel chocks in place front and/or rear. You want your motorcycle to be safely secured to the trailer so that nothing and no one is damaged. Reverse the above process and take care when taking the motorcycle off of the trailer. Drive safely and ride responsibly! Driving your car, truck or van with a trailer in back hauling your true love – your motorcycle – to any destination can be make anyone nervous. After all, you have either spent money, time, or both, keeping that motorcycle running and it probably holds a special place in your heart for the joy it brings you when you ride it. Having it hanging out behind you, where you cannot see it too clearly, will certainly make you paranoid about every noise or weird feeling you get through the tow vehicle’s steering wheel. So, what can you do to put your mind somewhat at ease and help make the drive a much less stress-inducing task which you must endure? Below are some simple tips which, if you follow them, should allow you to be closer to a clam state when behind the wheel far from home. 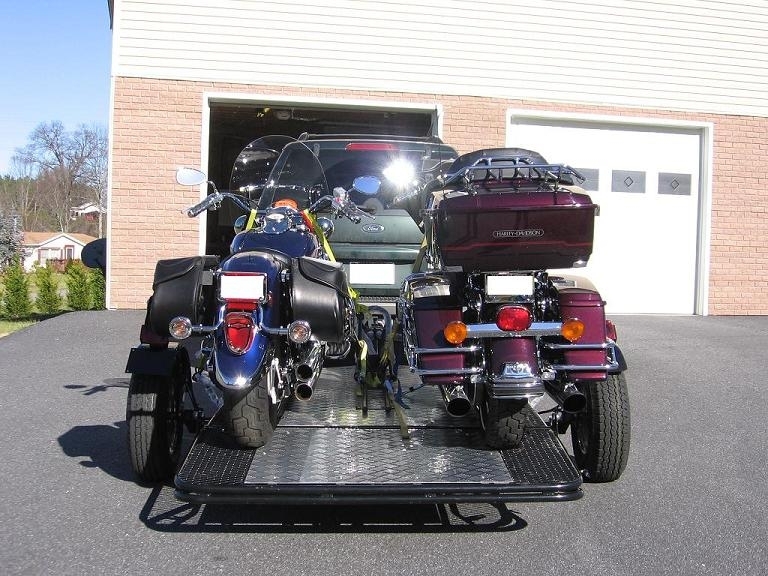 After you have loaded your motorcycle on your trailer and it is hooked up to your tow vehicle, go back every single connection and tie down point to ensure everything is tight and firmly in place. Do a visual, sometimes physical, inspection of each connection every time you stop for fuel or a break. Once under way, stop after about 30 minutes on the road and check each of the above areas again. If anything is loose already, make sure to make a mental note and play close attention to that area. Check the tire pressure on the trailer’s tires regularly while driving. Trailer tires usually hold more pressure than either motorcycle or your average automobile tire, so that means they have more to lose. Watch this closely. Do not forget that you have an extra vehicle attached to the rear end of your towing vehicle; some people will place a note where it can be easily seen by the driver to remember this fact. You might invest in mirror extenders, available at auto accessory stores, to allow you to see beyond the end of the trailer. Be careful when changing lanes as your vehicle is much longer now. Take your time on the roads. Both accelerating and slowing will take extra time and space, so be prepared for that. Hopefully, you have taken a few ‘demo’ rides with the trailer attached so that you feel more comfortable with it connected. Always park properly with the trailer attached. Your total vehicle length may be doubled by adding a trailer, so ensure you have enough room to park when you need to do so. Just take your time and include the trailer’s presence in every driving decision you make. Driving a vehicle which is towing something – anything – can be a completely different experience, so get some practice in before you start out on the long road to your destination. You need a trailer, but space at your house, apartment or condominium is very limited and you really have no room to store one. Your first thought would ideally be to look into folding or collapsible units, and there are many of them on the market, some for a reasonable price. However, if you do not need a trailer all that often and you are looking for something a bit more, let’s say protective, there is another option – you can rent your trailer. U-Haul rents enclosed trailers in locations all over the United States and some parts of Canada, and they are reasonably priced for a weekend or just a single day. Some of the benefits are that you get a fully-enclosed trailer – one which not only keeps road debris, weather, and the many insect sacrifices off your precious bike, but it also keeps prying eyes off of it so no one is tempted to take it from you – no maintenance worries, as U-Haul handles all of that, and you have much more room for gear, parts and even a spare engine. And, as a commercial would say, that’s not all; it’s lockable, fully stable at above-legal highway speeds, and you can rent it one-way and drop it off at any U-Haul location on the continent. That means no storage issues! Your only necessary investment is a wheel chock – make no mistake, this is and important part of this transport method. Your bike is back there, and it is enclosed, but it can still be significantly damaged should it get flung against the inside of the trailer. Get a wheel chock and save yourself worry, heartache and money. The portable models often sell for between US$120 and $250, but quality can be a factor, so do research before you purchase. 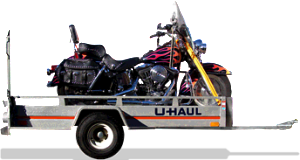 The rental fees for a U-Haul, or similar, trailer will often run around US$15 up to about $30 per day depending on the size you need – the smallest enclosed they offer will easily fit two motorcycles, though they will be close together if they are Honda Gold Wing-sized as the trailer is 37 inches wide (inside) and 96 inches long (overall). One problem with this method is your local U-Haul dealer’s popularity. If it is regularly busy, you will probably have to wait in a long line to get to your rental trailer. Reserving online will save money, so try there first; and you can also look up various locations close to your home and destination while you are there. The last concern is your tow vehicle as you will see a significant fuel penalty and you need a proper towing hitch, both of which are due to the U-Haul enclosed trailer’s extra weight. This method can save you money if you only trailer your motorcycle a few times a year. Most new trailers will run you at least 50 times the amount you would spend on renting a trailer for a couple of days (remember that another trailer would also cost you more fuel). If, however, you use a trailer several times in a week year-round, purchasing one is probably smarter and cheaper. You might even find an old enclosed rental trailer for sale. At least now you have a choice and another option for carrying your motorcycle safely to your destination. Pulling a trailer behind a motorcycle will have a noticeable effect on the way the bike handles and the way it feels. This is due to the extra weight and the new forces it adds. Often enough, this is easy to adjust for so long as you are an experienced pilot. But, what a rider wants is a trailer which does the same job but tips the scales a little less so there is no need to modify the way the bike is ridden. 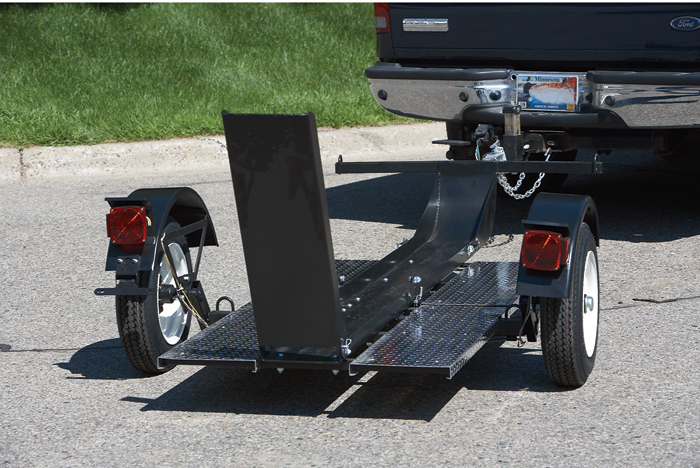 The USA Trailer Store has decided to satisfy that requirement with their Lumina Motorcycle Trailer. 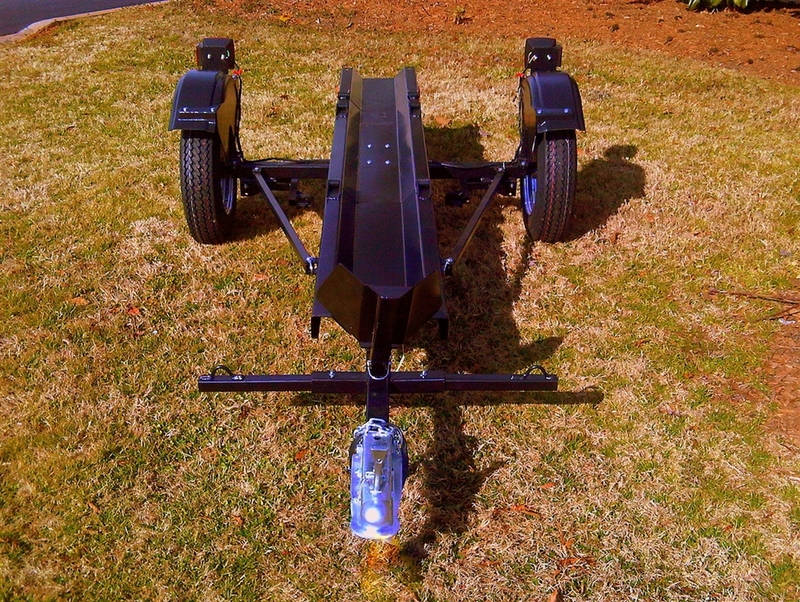 The Lumina motorcycle trailer’s secret is aluminum, 6061-T6 aircraft-grade to be precise. This allows it to be incredibly lightweight and yet very strong. In fact, it only weighs 170 pounds – less than an average human male and at least 30 pounds lighter than any other of its kind. To give it a long life of regular use, that entire assembly is powder coated. The 200-pound rated luggage rack on top is polished, though, but it does not detract from its durability and it looks tough with the diamond plate. Inside the main cargo area, arguably the primary feature of a trailer, is an expansive 14 cubic feet of carpeted and rain-proof storage which is accessed via the lid at the back. Underneath the Lumina is the foundation of this motorcycle trailer. It has an independent torsion suspension, allowing the wheels to more easily handle road imperfections and gives the trailer a silky smooth ride. The USA Trailer Store ships it with highly puncture-resistant six-ply 12-inch tires on some rather fancy five-star brushed aluminum wheels. A bonus feature of the Lumina trailer is the included swivel coupler. This is an important item to those mounted on two wheels, as opposed to the three of the compatible Spyder, owners of which can get a free cover instead. This swivel coupler allows the bike to lean as it normally does with the trailer in tow so that the addition goes almost unnoticed. It is also a far safer way of pulling the Lumina with your motorcycle as there is less chance of a conflict which causes a crash. Approaching the Lumina motorcycle trailer if you have never used one can be somewhat intimidating. It is big and very solid in appearance. Touching the aluminum, it feels very well constructed and opening the trunk is an experience – it is very large. 14 cubic feet is a great deal of space. If your bike also has saddlebags and a top case, such as a Gold Wing or an Electra Glide, there is enough room for two people to cross continents in comfort here. With the addition of this trailer’s flexibility, you can also take a variety of trip types; rallies, beach trips, even camping in national parks for the summer are all now possible. The Lumina not only adds storage space, it expands your capabilities. Installing the hitch mount and hitch may be best left up to a professional with some models, but others are simple bolt-on affairs. Either way, even if the Lumina is very lightweight, it is good to have a strong mounting system in place for using it. The machine used for this test made use of a Bushtec model which is actually over-built for the purpose. The Lumina, of course, connected easily with no hassle as any well designed motorcycle trailer would. What the Lumina does do better than any other similar trailer is disappear. Filled with a nearly maximum load, there is no doubt there is more behind you when taking off. You will notice it again when you get to your first traffic signal or stop sign as you need to begin braking a little earlier than normal. This difference is not upsetting, just apparent. On the highway, though, is where the Lumina accomplishes its magic; if you are the forgetful sort, you just may think you left your trailer behind. Riding at speed is exactly like it was before you hooked up a trailer. And, you have every possible piece of gear you could need right behind you. It’s tempting to keep going. 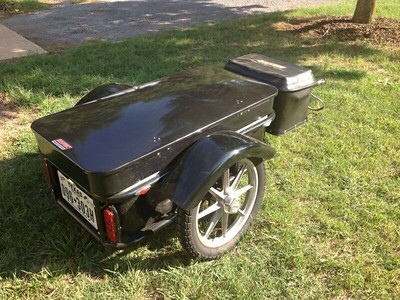 This motorcycle trailer has been so well constructed and uses such lightweight materials, it is very hard to believe that it can be purchased for so little. It is also backed by a five year warranty, so you know you can count on it to be durable. And, it is merely the base model. The Lumina may also be purchased in an XL version which adds four more cubic feet of storage. The Lumina has so much going for it that it appears to be a step ahead of any of its competitors. Should you love to take to the road for the very long haul with your beloved, or you really want to carry cargo across the world while riding your bike, and you care about retaining the best experiences of riding a motorcycle, the Lumina motorcycle is the perfect companion for your ride. The most commonly reviewed motorcycle trailers are those for carrying a motorbike, but what about trailers for a motorcycle? There are many more on the roads of the world than ever before, and they have advanced to the point where those designed to ride behind a motorcycle are not but a tiny version of a trailer you would pull behind your truck. They are a specialized need, and often only used by riders going super-long distances or carrying equipment for a job, but all one needs to use one is the right bike and a good reason. A good multi-purpose tow-behind is a great first buy when starting out into this trailer life. 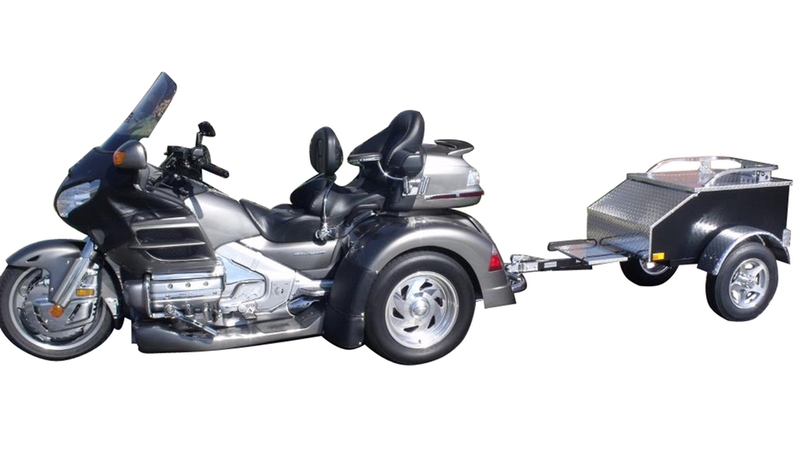 The Bushtec Spartan Utility Trailer suits a variety of needs, can be utilized by many types of motorcycle or trike, and is most appropriately named. Bushtec’s Spartan Utility Trailer is quite lightweight and looks like it with a very open welded tubular steel-trellis chassis, which is powdercoated in either black or silver, and some very airy looking 16-inch aluminum wheels, which carry lightweight, narrow-section tires. Holding those wheels to the trailer is an advanced, proprietary Bushtec adjustable dual A-arm suspension that allows the trailer to handle better than a light-goods vehicle and something close to a high-spec roadster. So that this fluid – but admittedly different than a motorcycle – movement does not upset the bike, a strong and flexible 360-degree swivel heim joint (also known as a rose joint or rod end bearing) is employed in the hitch. In this basic configuration, the entire Bushtec Spartan utility trailer weighs a mere 115 pounds (52 kg) but can haul 235 pounds (107 kg), making for an enormous increase in cargo capacity for your two-wheeler. Overall dimensions of the Spartan are quite appropriate as it is not much wider than a full-dress bike with panniers in place, its fairly short even with the tongue, and it is close to the ground but still has great ground clearance. It measures 80 inches long by 38 inches wide by 30 inches tall and has interior dimensions – the ‘bed’ – of 44 inches long, 23 inches wide and 10 inches deep. That space allows for a number of important pieces of riding-related equipment; in fact, it easily fits a cooler, a small bag of charcoal, and a large selection of groceries all at once. Those BBQ or camping supplies are kept safe in the Spartan with a complete electric lighting system, with an optional isolated version available, which hooks to the motorcycle’s rear brake and marker light. The Spartan’s 16-inch wheels are where Bushtec wins with this utility trailer, though, due to the stability they provide since they spin at a nearly identical speed to the towing motorcycle’s hoops. It hauls down the road smoothly and tracks true due to those well-heeled physical properties and that high-spec suspension. It even looks good doing its job with the sculpted fenders, modern LED lighting, and smooth, incredible and indelible finish, each of which give Bushtec further high marks. 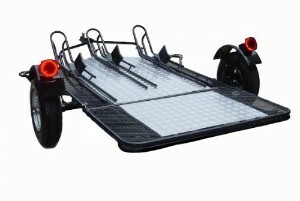 If you think this is a thoroughly top-quality trailer which will have you wishing Bushtec manufactured rigs tocarry motorbikes instead of only for them, then you have the Bushtec Spartan utility motorcycle trailer nailed down perfectly; it is of another level and gives nothing away to any company, of any size, which makes any sort of trailer. This lovely trailer, the Bushtec Spartan, starts at US$1499, but has many options and accessories available which can be added at time of purchase. Some of these include added bling like a chrome chassis neck, glossy powdercoated wheels, extra locking security cables, a tongue weight scale, hitch pin adapters, the electric isolator and even includes the Bushtec version of that aforementioned cooler. It can add up fast, but with the quality build and the innovative design, the Bushtec Spartan utility motorcycle trailer will be with you long enough to easily make it cheap in the long haul – pun intended. Motorcycles can be cheap transport and can save you space, money, and provide you with nearly unending pleasure even when simply commuting to and from work. However, there are also plenty of bikes on the roads which cost closer to what you would pay for a four-door sedan and do not often get ridden when the weather turns nasty. And, some of those still must make regular shows or events along with the rider. Transporting such machines is a nerve-wracking experience if there is no choice but to push them up a flimsy, bendy ramp into the high bed of a properly suspended truck. Relieving that stress from your life – not to mention the strain from your back – is now possible thanks to the Rampage Power Motorcycle Lift. The Rampage power motorcycle lift is exactly what it says it is – a power-assisted motorcycle lift. 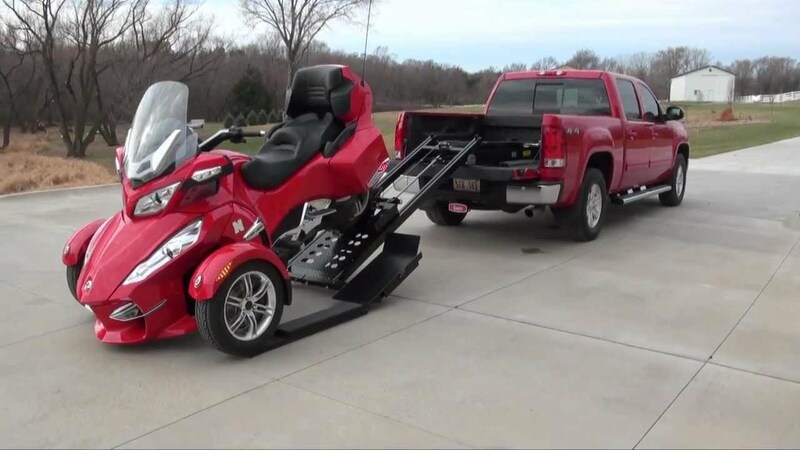 It is designed to lift nearly any sized motorbike into the bed of a compact or full-sized pickup truck or any sort of flat-bed multi-wheeled transport. It is constructed of 1/8-inch high-quality, black powdercoated, carbon steel, guaranteeing its durability and weather-resistance. Keeping things moving smoothly are maintenance-free HMW nylon rollers, which require no lubrication, and the All Weather 12-volt 4,000 pound electric winch, that also has a cable remote control for even easier loading. Power is provided by a second cable of the quick-disconnect variety which runs from the truck bed through to the vehicle’s battery. The standard unit measures 95 inches long and 24 inches wide and sits about 7 inches high, and it all is easily installed in a bed as high as 39.5 inches off the ground. Attaching the Rampage lift to wherever you need it is as simple as installing a single bar affixed with two bolts; two more identical bolts hold the Rampage assembly to that bar and the Rampage holds your bike for the drive. What really separates the Rampage from similar power lift setups out in the market is that it can be quickly removed and, with a second bar in place, can be used in another vehicle. The built-in wheels allow this rather heavy device to be moved as a little easier, and it can be disassembled into three pieces should it be necessary for storage or if only one person must uninstall it solo. Holding the motorcycle in place is a sturdy, widely-accommodating, six-inch wide steel cradle and two tie-down points on either side of it. For strength and durability, the entire Rampage motorcycle lift is precision welded or connected with 0.5-inch thick bolts, so calling it a “sturdy lift” would be considered understatement. Installing the Rampage power motorcycle lift gives one a sense of just how heavy-duty it is, but that characteristic does give it a real feel of ruggedness. Three holes in total must be drilled into the bed and frame of the carrying vehicle, but this is no more drastic than a wheel chock, and is as simple to do, too. Once in place, loading is really a piece of laid-back pie; once tied down, simply click the switch and watch the motorbike ride up into the bed. Unloading is just as simple and takes a little less time. The end of the unit will stick out on shorter beds, but this should be expected from a device like this one, so no complaints there. The real strength of the Rampage lift, though, has to be how easy it makes everything which used to be a little scary and that it is incredibly flexible in this ability. And, there is where the Rampage really impresses; list price is actually a semi-reasonable US$2795, with a continual sale of about $200 less, but that is without the possible accessories. A trike adapter is available for $795, a ‘sled’ adapter for snowmobiles sells at $299, an even longer ramped version adds $100, and you can have one of custom length for an extra $185, which is actually an extension. Get the last ramp you will ever need for your expensive and highly-prized motorcycle, the Rampage Power Motorcycle Lift. Moving a motorcycle from one location to another takes some planning – moving two or more requires a complete transport solution which can safely carry them on the road. A big truck is one of these, but not everyone has one of those, and even fewer have the money to pay for the massive amounts of fuel they consume. A good tow vehicle, however, is not that hard to find – even the modern family sedan can tow enough weight to carry a motorcycle or two. 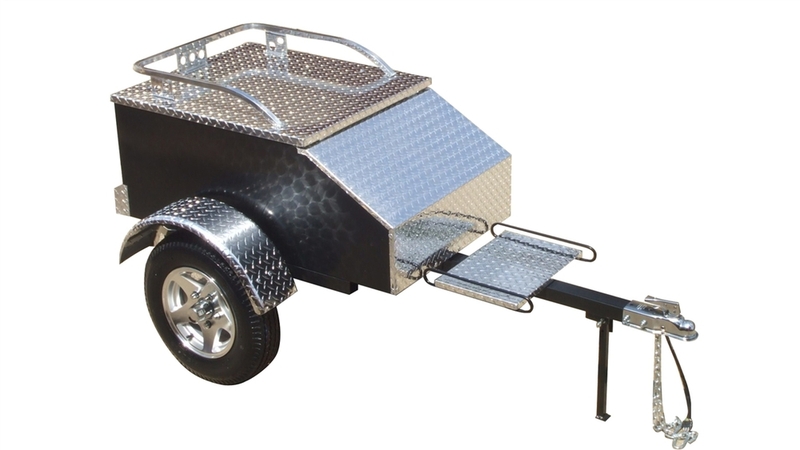 What you need is a trailer, and The USA Trailer Store has that: The Trinity MT3 Three Rail Motorcycle Trailer. The Trinity MT3 three rail motorcycle trailer is an ideal platform for transporting three bikes at once, or two bagger-style cruisers, to any destination which the road travels. The MT3 is built of a tubular steel frame for incredible strength and light weight. On top of that frame resides a five by seven foot (1.5 by 2.1 meters) diamond-plate deck which is designed for multipurpose use; all the user must do is remove the included wheel chocks and rails. Those wheel supports, when combined with the numerous tie-down points, allow each of the bikes to be held firmly in place. Thirteen inch (33 cm) chrome wheels connect to a torsion axle which both provide for a smooth ride and protect the bikes on board from bearing the bumps and jolts of the local or foreign tarmac. The Trinity MT3 is more than just a trailer, it is a workhorse. As for portability, the Trinity MT3 Three Rail does not fold and stand up like the many popular folding trailers, but it is much less expensive and more flexible. With the ramp at back being wide and easily deployable and combined with the individual wheel chocks, loading the MT3 is very easy and can be done with only one person, saving you time and trouble. The entire unit only weighs in at 425 pounds (193 kg), but is strong enough to hold any group of two or three motorcycles you can fit upon it. Even with three full-sized bikes (non-cruisers) loaded up, the Trinity MT3 Three Rail motorcycle trailer can be pulled from any vehicle that can handle a Class II or above hitch. Taking out the Trinity MT3 Three Rail is as simple as any well-made trailer. Hook the trailer up to your tow vehicle, deploy the back ramp, push the bike up onto one of the three rails (be careful to load it evenly), tie it down, move on to the next bike, and the next (if necessary), and then slide the ramp into place and you are ready to move out. On the road the trailer is well-behaved and rides very smoothly thanks to its integrated suspension. Of course, you must remember that you are pulling what amounts to a second, un-powered vehicle behind you, so take care. Unloading is just as easy as putting a bike on board and, when you are done, simply fold in the rear section and it will fit into a small parking space. (Again it is not as compact as some folding models, but it is also nearly US$1000 less.) Carrying bikes should be this easy every time, and the Trinity MT3 Three Rail motorcycle trailer stands as one of the best choices on the market today.Suggested retail for the Trinity MT3 Three Rail motorcycle trailer is supposed to be US$2650, but its average is around $1700, less on eBay. Finding this unit is not very difficult, so ask around, you may end up finding a local shop where you can get great service and a low price. 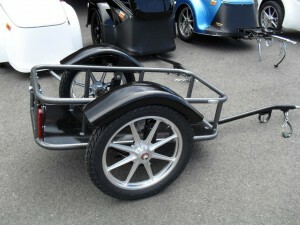 Numerous folding motorcycle trailer models are available to the interested motorcycle owner in need of a towing solution. Along with the quantity of choices, the quality of trailers has also improved over time…but you often pay dearly for the top tier models. The Ultra-Tow Single-Rail Folding Motorcycle Trailer is one from the higher end of the quality scale, is a worthwhile and widely available choice for transporting a motorcycle, and is actually rather inexpensive. Finding a place to purchase the Ultra-Tow single-rail motorcycle trailer is as simple as finding an Internet connection, but try your local dealer first – you might find a good deal there. Once you do get a good look at one, the idea behind why these are so popular becomes very obvious – the Ultra-Tow folds up into a tidy, tiny package and will store easily against almost any wall; it will collapse into a space about five by five by two feet in size. When you need the Ultra-Two single-rail, you simply unfold it, lock everything in place, and you are ready to go. Constructed with a frame of steel and a rail and deck of aluminum, the Ultra-Tow single-rail motorcycle trailer can haul up to 700 pounds (317.5 kg) – suitable for most production motorcycles sold today, though not all. The deck is a full six feet long and just under a foot wide, again accommodating a wide variety of bikes. The two wheels are 12 inches (30.5 cm) in diameter and nearly five inches wide for solid tracking on the road and decent bump-absorption. Those wheels come equipped with both fenders and proper lighting on the top of each. There is also a built-in ramp and an anchor bar across the trailer tongue with burly loops on each end; these work to hold your motorcycle firmly into the built-in front wheel ‘pocket’, which acts like a chock, when tie-downs are employed. 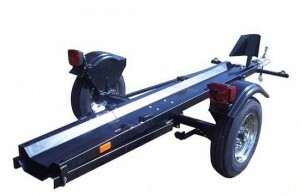 The Ultra-Tow Single-Rail motorcycle trailer has a rich feature list. The predominant attributes of the Ultra-Tow Single-Rail seem to be strength and light weight – the unit weighs only 290 pounds (132 kg) – and those are the two most desired in a motorcycle trailer. 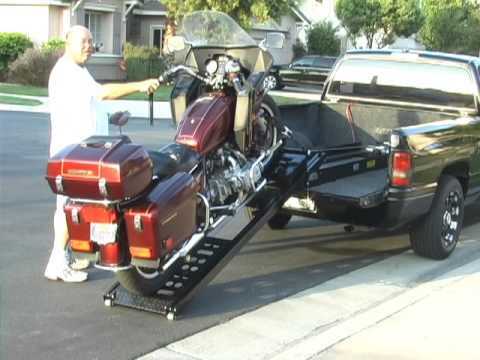 The ramp, which doubles as a rear ‘gate’ of sorts, makes loading very easy, and once the motorcycle is secured in place and the trailer hooked-up to the tow vehicle, it makes for a reliable mode of transport. The whole trailer is well-made and durable, though some state highway systems may put this to the test. The coupler is a very common 1 7/8 inch and should fit any hitch within the market where it is sold; safety chains are shipped with the unit. Unloading the Ultra-Tow single-rail trailer is just as simple as the first part: drop the ramp and roll the bike down to the tarmac, and you can make use of the rugged sideboards. Folding things back up for storage is simple, but does take some coordination. 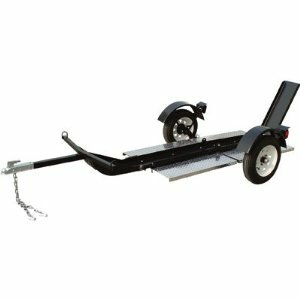 Looking for the Ultra-Tow single-rail motorcycle trailer is as simple as looking through your favorite search engine or contacting your local dealer. The suggested retail price is US$800, and that is where it is most often priced; however, free shipping is often included. That is a fair bit, but much less than many in this class – and the Ultra-Tow single-rail motorcycle trailer comes with a limited 12 month warranty on parts. This is the transportation your motorcycle will enjoy taking advantage of and what you spend can easily be factored over the many years of service one will likely get from the Ultra-Tow single-rail. There are many ways to transport a motorcycle, but we are all limited by the equipment we have on hand for the task. Who can justify purchasing a pickup-up truck just to carry a bike around when we can barely afford to pay for our own food? No one can. And, that is why someone, not too long ago, created the hitch-mounted motorcycle carrier. Many versions of this nifty device exist, but among the least expensive of these is the T-Motorsports Dirt Bike Carrier with Ramp. T-Motorsports builds the Dirt Bike Carrier with lightweight aluminum, keeping the stress on your trailer hitch to a minimum. The standard two-inch hitch receiver is required for it to work, but most tow vehicles are so equipped or can be. The surface of the carrier is coated to prevent rust and to make cleaning a cinch. An aluminum ramp is included with the carrier which allows for easy loading and can be detached and then stored behind the unit itself. Since it is made specifically for off-road motorbikes, its maximum carrying weight is 400 pounds (181 kg). However, that does mean that the Dirt Bike Carrier can haul virtually any production dirt-focused motorcycle under 500 cc with ease. Assembling the Dirt Bike Carrier is quite simple due to its very basic design and implementation. The package comes with everything you will need – save tie-downs – and it should be easily possible to put it all together in a matter of minutes. Loading the bike is almost as simple; once the carrier is in place, simply attach the ramp, roll the motorbike into place, and then tie it down. Deep wheel-wells hold things steady while in motion and, if properly secured, there is no reason to worry about the bike being on the tail end of your vehicle. One problem with the carrier, though, comes when unloading. Unless you have arms like Mr. Universe, you may need help getting your bike out of those deep wheel holes – sometimes, three people are needed. The T-Motorsports Dirt Bike Carrier is not a perfect solution – to be fair, it does lack some attention to detail found on some competitors – but it is certainly priced right and it will do the basic job of safely moving your dirt bike from point A to point B. 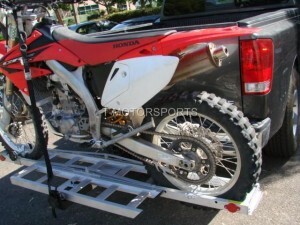 Suggested retail pricing on the T-Motorsports Dirt Bike Carrier with Ramp is around US$90. Considering just how helpful this device could be for those without a truck or another way of easily moving your motorbike, the Dirt Bike Carrier with Ramp could find a home in yours. The market for folding motorcycle trailers has constantly grown over the last few decades; it started with one good idea and it took off right after customers learned just how handy these appendages can be for the rider who needs to haul a bike. Once the job is done, these trailers will fold up and usually fit into a small space against a garage wall or under a bench. What may be the simplest and most functional form of this innovation is now available: Ace Single Rail Folding Motorcycle Trailer. 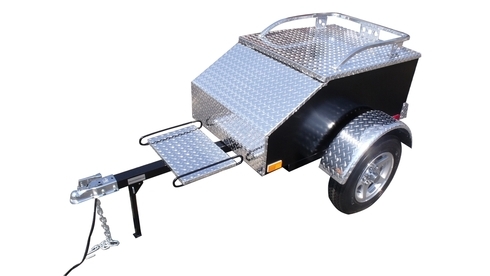 The USA Trailer Store manufactures Ace Single Rail folding motorcycle trailer along with many other popular models, and that status was earned as a direct result of quality construction. The One is made of high-grade steel which is specifically designed to be strong where needed and lightweight everywhere else. That weight is right around 264 pounds (120 kg), which puts it at the low end of the scale; that saves fuel and your tow vehicle some stress. And, when you are done, it takes just minutes to fold The One Single Rail folding trailer into a very small package which should fit in a small corner of your garage. The steel rail and ramp run right down the middle of Ace Single Rail trailer and both are designed to guide the motorcycle right onto the unit with no chance of veering off and going “crunch.” At the front of this rail is a chock-type stop for the front tire, and a cross-bar mounted to the trailer’s tongue has a loop on each end for affixing tie-downs. The wheels are a full twelve inches (30.5 cm) in diameter and are shod with trailer-specific tires. Each of those wheels has a fender and a tail/brake light which is connected to the tow vehicle’s electrical system. 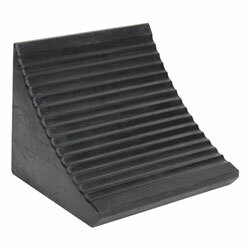 The entire unit is powdercoated in black for long-lasting durability. The One Single Rail has only what it needs for a safe and secure transport of your motorbike and nothing it doesn’t need – economy is the focus here. Moving one sportbike or cruiser on The Ace Single Rail motorcycle trailer is very simple, as it is with many of these units. 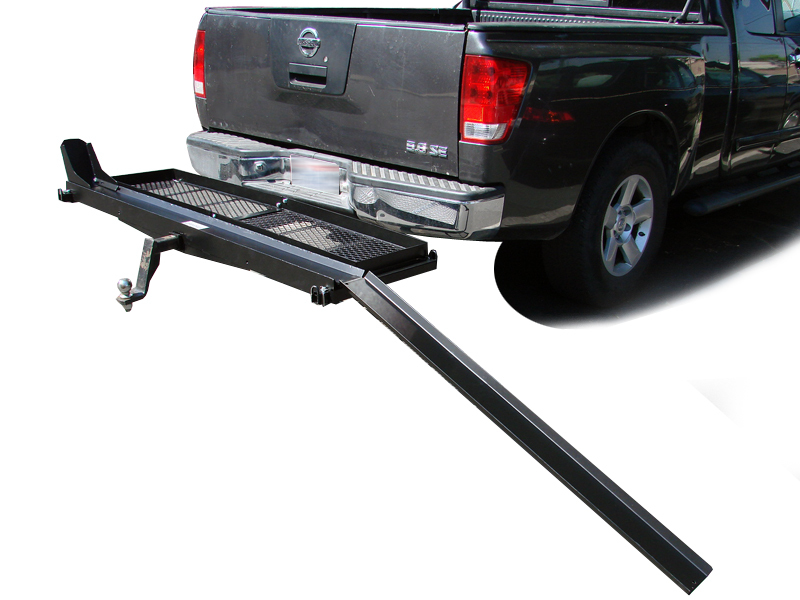 Simply affix the trailer to your tow vehicle, slide out the ramp, push the bike onto the trailer, and then secure it in place using quality tie-downs. After that, all that is left is to slide the ramp back into its cubby, lock it there, and then you can drive to wherever you need to be. Unloading is the opposite of the above, and the low height makes it an all one person affair. Collapsing the trailer for storage will take about five minutes once you are well-versed in the process, and all you have to do is stick it somewhere until you need it again. The Ace Single Rail motorcycle trailer is one of the simplest motorcycle trailers on the market – and it is among the lightest and most durable as well. Suggested retail price for The Ace Single Rail motorcycle trailer is around US$1170, but it can be found for less – check with your local dealer as you may find a good discount. This piece of equipment is designed to last for your lifetime, so all you need do is take good care of it and you will have an easy-to-store and simple-to-use single motorcycle transport solution for the rest of your riding life.